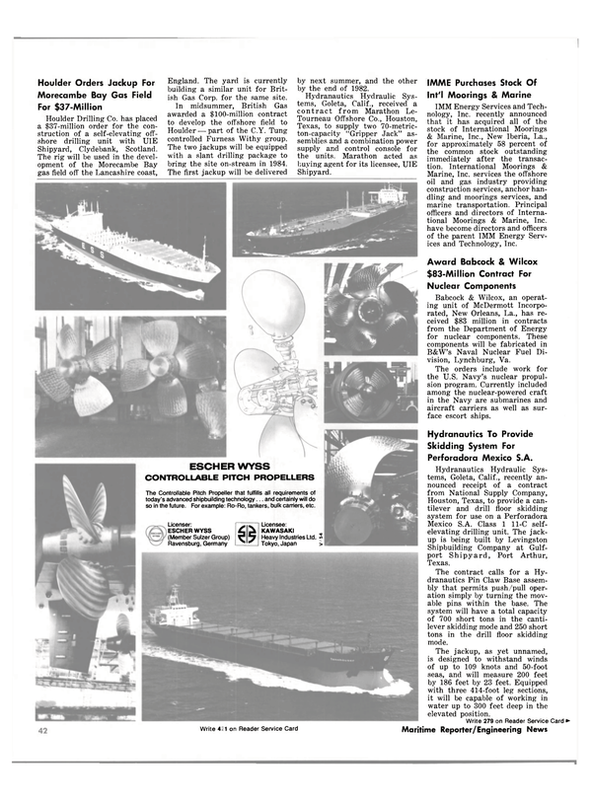 A steady upward climb in the world orderbook for the 27-month period from January 1979 to April 1981 has been reported by the newsletter Bremen International, published by the Senate of the West German city. As of April this year, for vessels 2,000 dwt and over, there were 1,707 vessels on order — more than 51.6 million total deadweight tons. The lowest point in international shipbuilding during the last decade was reached in January 1979. The total order for the shipyards of 39 major shipbuilding countries—including the communist-controlled Eastern- Bloc countries and China—at that time was 1,315 ships with a total of 30.2 million dwt. The high point of the last decade was reached in mid-1974 when 2,935 units of more than 233.8 million dwt were on order. In the improved figures reported for the period ending in April of this year, the six foremost shipbuilders were: Japan, having orderbookings for 20.441 million dwt, 39 percent of the total orderbookings of the world shipbuilding industry; followed by South Korea, with 4.420 million dwt (8.2 percent) ; Brazil with 2.980 million dwt (5.8 per- cent) ; Spain with 2.514 million dwt (4.8 percent) ; Romania with 1.712 million dwt (3.4 percent) ; and Poland with 1.509 million dwt (2.9 percent).